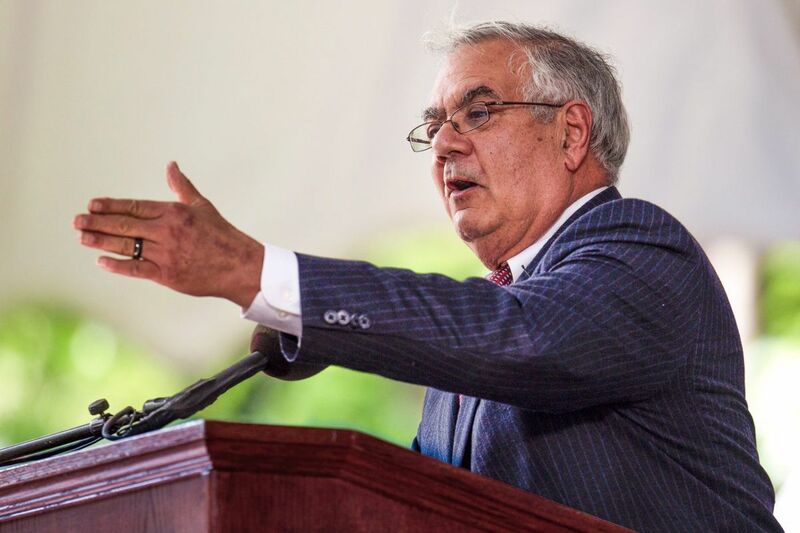 Former U.S. Rep. Barney Frank (D., Mass.) is teaming up with an old Harvard classmate for the performance. Who'd have thought that retired congressman Barney Frank and longtime Philadelphia orchestra conductor James Freeman would take a journey into jazz? Together? Freeman's Chamber Orchestra First Editions, which is beginning its third season, announced Monday that Frank will narrate the Gunther Schuller piece Journey into Jazz for three performances Oct. 6-8 at venues in and around Philadelphia. "Having just ended one career," Frank said in a statement, "I am happy to make my debut in another branch of public performance — although this one probably won't last 45 years." Frank and Freeman are old friends from their years as Harvard University students. Frank was a member of the U.S. House of Representatives (D., Mass.) from 1981 to 2013. In 1987, he became the first openly gay member of Congress. Freeman had further studies at Tanglewood, and Vienna's Akademie für Musik, and became professor of music at Swarthmore. He is now professor emeritus. The piece Frank will narrate, Journey into Jazz, was written by Schuller in 1962, much in the spirit of narrated orchestral works such as Peter and the Wolf, but with music that's often called "third stream" — an integrated fusion of jazz and classical. Journey into Jazz tells the story of Eddie, a kid who barricades himself in his room, listening to jazz recordings and who eventually joins a group of jazz musicians in a nearby basement. The program is not out of character for Freeman, who for decades championed a wide range of modern music as conductor/founder of Orchestra 2001. The mandate of First Editions is pairing early Mozart pieces with modern works, which in this concert will also include Gabriel Globus-Hoenich's newly commissioned work for jazz quintet and a string orchestra. The Mozart works include Piano Concerto No. 12 with soloist Andrew Hauze and Symphony No. 29. The concerts take place Oct. 6 at Lang Concert Hall in Swarthmore, Oct. 7 at Roberts Hall at Haverford College, and Oct. 8 at the Kimmel Center's Perelman Theater. The first two concerts are free. The Kimmel Center concert requires tickets, priced $10-$20.